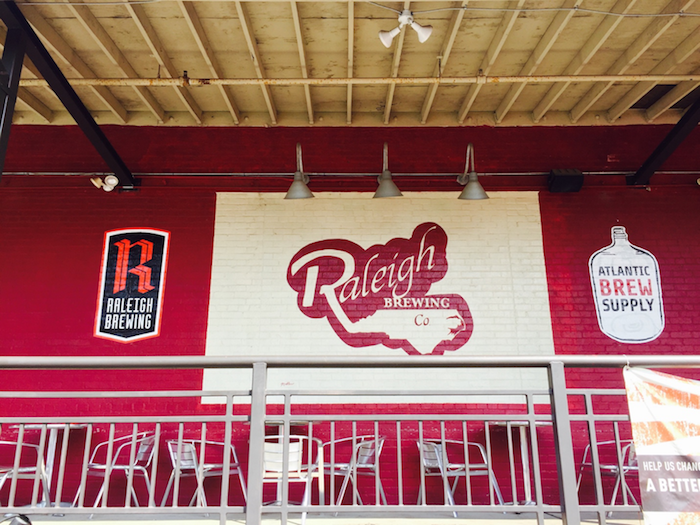 Raleigh Brewing Company is led by Kristie Nystedt, the first woman to own a brewery in North Carolina. Along with the brewery, she launched Atlantic Brewing Supply and ABS Commercial in 2013. After working in corporate America for 20 years, she recognized an opportunity and went for it. Her husband was involved in home brewing and she noticed there was no market for local supplies on a small scale or for large commercial operations. 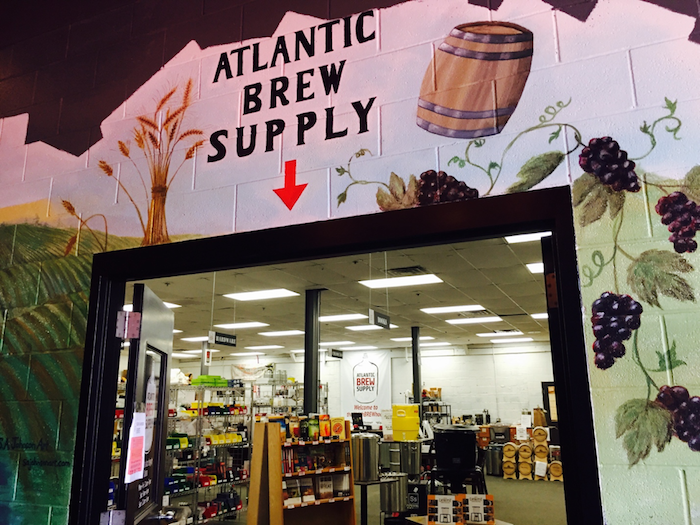 Atlantic Brew Supply has now become the largest homebrew supply shop on the Eastern Seaboard. ABS Commercial sells parts for breweries, offering brewhouses, tanks, stainless Tri-Clamp parts, and Sanke kegs. However, it is more than just making beer to the Raleigh Brewing family or companies. It is about community involvement and working with nonprofits in the city. For instance, every day there is something different going on at the brewery. There are cycling groups on Tuesday night, weekly live music, and even the “Fleet Feet Social Run” on Wednesdays. The brewery is also a supporter of annual events on Hillsborough Street like Live & Local: Roots Fest. They have sponsored the Young Alumni Zone at Packapalooza each of the past four years. 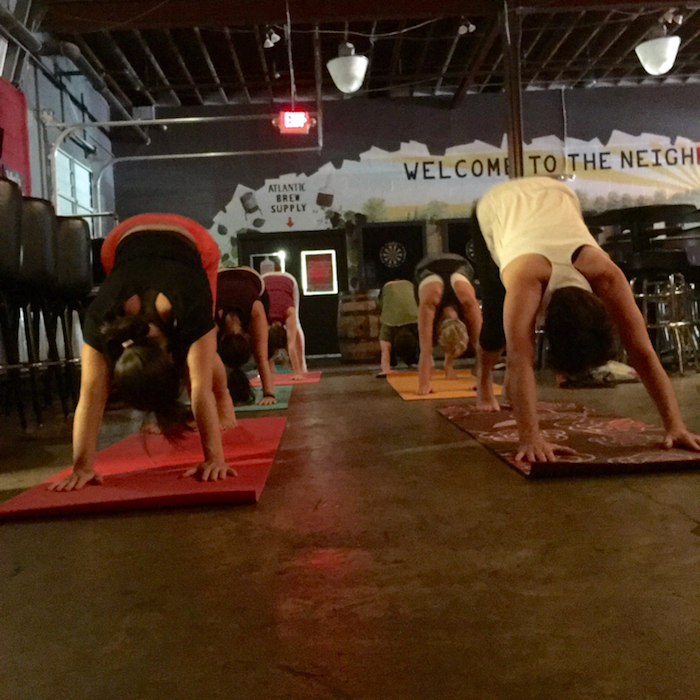 Tours are offered on Saturdays, and Pints & Poses yoga is a classic Sunday event for beginning and intermediate practitioners. Now, let’s talk about their award-winning beer. They have six core brands, ranging from their signature Hell Yes, Ma’am Belgian Golden Ale (9.2% ABV) to the Coffee Hidden Pipe Porter (6.3% ABV). Raleigh Brewing’s seasonal selections are some of the most popular in the Triangle with The Toll Imperial Stout (10.5% ABV) and The First Squeeze American Wheat Ale (6.6% ABV) receiving rave reviews around our office. To celebrate the arrival of the International Bluegrass Music Awards to Raleigh every year, they release Dear Ol’ Dixie Pale (5.6% ABV), and Raleigh Brewing taps a firkin, or cask, filled with a special small batch of one of their brews. The taproom, which was recently renovated, is a welcoming area with murals of the city on the walls. Their outdoor seating recently expanded with additional tables and umbrellas and their interior renovations won them a “Most Improved Bathrooms” award. There are plenty of activities to do in the taproom from darts, to board games, and some classic arcade games like Galaga. A private Tavern Room can be rented for meetings, celebrations, or any type of event. They have big events to celebrate seasonal releases and their anniversary party, held in March, is not to miss. 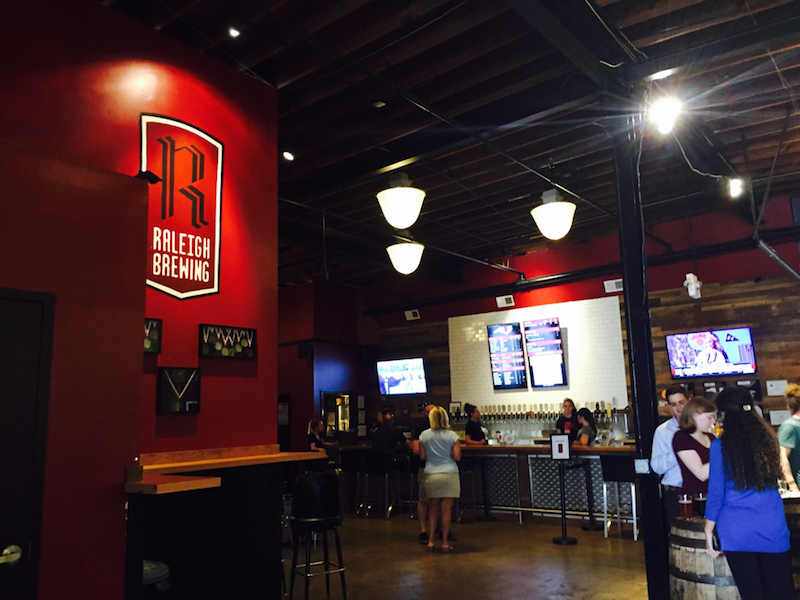 With over 200 accounts of their beer in the Triangle area and Wilmington, there are plenty of opportunities to try out Raleigh Brewing!